The JUpiter ICy moons Explorer (JUICE) mission is the first class L mission selected as part of the European Space Agency's (ESA) Cosmic Vision 2015-2025 program. 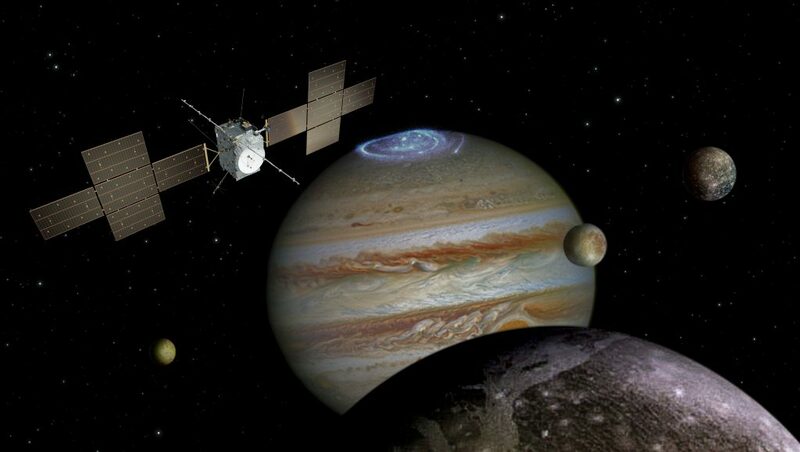 The JUpiter ICy moons Explorer (JUICE) mission is the first class L mission selected as part of the European Space Agency’s (ESA) Cosmic Vision 2015-2025 program. The launch is scheduled for 2022 for an arrival in the Jupiter environment in 2030. The goals are to explore the Jovian environment and the three Galilean moons: Europe, Callisto and Ganymede. Particular attention is paid to Ganymede because of its similarities with the Earth: the presence of a strong magnetic field, an ionosphere and an ocean. Artist’s impression of JUICE exploring the Jovian system. Credit image ESA. The MIME (Mutual Impedance MEasurement) instrument was proposed in 2012, through the RPWI (Radio Plasma Waves Investigation) consortium led by IRFU, Sweden. The objectives of the MIME instrument are to measure plasma parameters: electron density, and under certain conditions temperature and electron gyro frequency. The technique used is the mutual impedance mutual which allows access to an absolute measurement of the electron density, derived from the plasma frequency over a wide band 3 kHz – 3 MHz. This wide band allows access to densities of a few particles per cm3 up to 10,000 per cm3. The instrument interacts with 2 types of sensors, four Langmuir probes and three wire antennas dedicated to high frequency waves.